Potential evapotranspiration (ET0) is one of the main elements when computing agricultural irrigation requirements and scheduling. 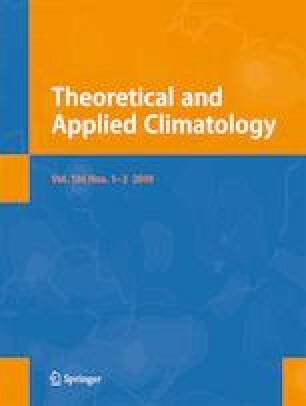 All climatic parameters as well as ET0 are influenced by climate change. The aim of this study is trend analysis of monthly and annual ET0 time series in the west and NW of Iran. Values of ET0 are estimated at 36 selected stations, using the FAO-56 Penman-Monteith (FAO-56 PM) method. Then, the non-parametric Mann-Kendall (MK) method was used to detect trends. The slopes of trend lines are estimated using Sen’s estimator approach. Results showed that about 86%of the monthly ET0 time series had upward trends of which 35.6 and 43% were significant at 0.01 and 0.05 levels, respectively, 47.4% exhibited a significant upward trend at the 10% level. In contrast, less than 0.7% of the whole monthly ET0 time series showed a significant downward trend (α < 0.01). Only 1.1% of the monthly ET0 time series had significant downward trends (α < 0.10). The strongest positive upward trend (significant at the 0.01 level) was detected in August at the Kermanshah station. However, the strongest negative downward trend belonged to the Khodabandeh station. The steepest upward and downward monthly ET0 slopes were observed at Maragheh and Khodabandeh stations. The magnitude of trends for these two stations are estimated as 2.33 and − 2.01 mm/year, respectively. On an annual timescale, above 94% of the stations had upward trend slopes. About 67% of the total stations exhibited significant trends at the 10% level. Very few sites (2.7%) showed downward annual ET0 trends (α < 0.10). At the annual scale, the first three strongest upward trends belonged to the Kermanshah, Urmia, and Tabriz stations, respectively (α < 0.01). It can be concluded that ET0 in the west and NW of Iran have an increasing trend for most of the stations. Therefore, it is important to use water in a prudent manner in this area. The authors wish to acknowledge the Islamic Republic of Iran Meteorology Office (IRIMO) for providing weather data needed for this study. Also, we appreciate the Editor and the anonymous reviewer for their critical comments which improved the manuscript considerably.